We offer our clients a large inventory of PVC adapters. Our PVC Adapters are available with a female pipe thread (FPT), male pipe thread (MPT) or socket in various sizes to meet all PVC pipe fitting needs. 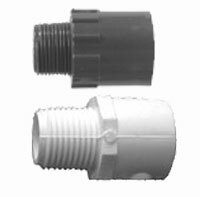 Our PVC adapters come in a variety of sizes for almost any piping configuration. We offer schedule 40 PVC adapters and schedule 80 PVC adapters. We also carry a full line of stainless steel fittings. View an overview of our product offerings. Our PVC adapters are available in multiple sizes and thread/socket configurations. View our PVC product dimensions. Please review our product dimensions to confirm your specifications. Our pipe sizes and weights chart will help you search for individual product specifications. This pipe chart can assist in your selection and guide you to products available at Shaw Stainless. Our PVC Adapters conform to ASTM D-2464 & ASTM D-2467. View our standard specifications chart. View the thousands of PVC pipe fittings we offer. This Reference Catalog identifies PVC pipe fittings through specification charts and illustrations.